The lowly surface grinding wheel is one of the workhorses of the precision tool grinding shop. When you consider the cost of the wheel against how much work it does, you can see that it is highly cost effective. Unfortunately, there seems to be a rather arrogant outlook on surface grinding, and thus the grinding wheel as well. This is because so much former grinding work has been taken over by the wire EDM machine. While this is certainly true, it does not mean the death of surface grinding! It just means there is less of it, but what remains is still quite important, in fact essential. In a typical mold making or tool and die shop, virtually every single workpiece has been ground at some point. Another reason precision tool room grinding has diminished in quantity is hard machining. This type of milling is very accurate, and leaves a very good surface finish as well. Yet, even here the cavity or die block had to be ground and there will almost certainly be subsequent grinding as well. Never keep the grinding wheels lying about in heaps, just waiting to be damaged. It does not take much effort to mount them on a wall, or organize them in a drawer. A thorough 5S program does wonders for the grinding department, and any other as well! Label the space the wheels occupy. This will save a lot of time when searching for the right grit or hardness of wheel. It is also a good idea to organize them by convex or concave radii, angles, etc. By keeping them in their place you will no longer have to search high and low or hide them in your toolbox. 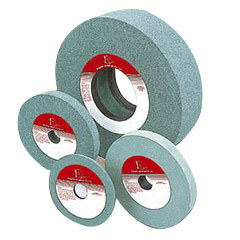 Buy only quality grinding wheels, such as those made by Norton, Bay State, or Camel. For basic, flat dressing you can use a single point diamond, cluster diamond, or, if you are lucky, a mounted diamond dresser over the wheel. When using a single point diamond, you can hear if the diamond is dull. This will rip the grit from the wheel, rather than cut it off, leaving a dull wheel that produces a poor finish, heats the workpiece, and wears out quickly. One simple remedy is to rotate the diamond to expose new facets. Move it away from the wheel as well, using new angles that expose new areas of the diamond. This will extend the life of the diamond, give a much better surface finish, and enable the wheel to last much longer. Even though the manuals all say not to grind with the side of the wheel, it happens all the time. Sometimes this is the only practical way to grind a surface. You don’t need a wheel dresser, just a diamond and a Norbide stick. Here are some techniques that might help. Do not leave a step on the side of the wheel. Instead, leave a feather edge. This can be done by feeding the diamond into the wheel as you move the table longitudinally. Plunge grind instead of using the cross feed. Once you establish your dimensional location, raise the wheel and then plunge down. This greatly reduces the heat factor, which is the enemy of side wheel grinding. As soon as you see the workpiece heating up, stop and redress the wheel. You cannot change the fact that the wheel is loaded or dull by continuing to grind. You can also dress the side of the wheel with a Norbide stick instead of the diamond. Hold the stick at an angle to produce the feather edge that cuts so well.